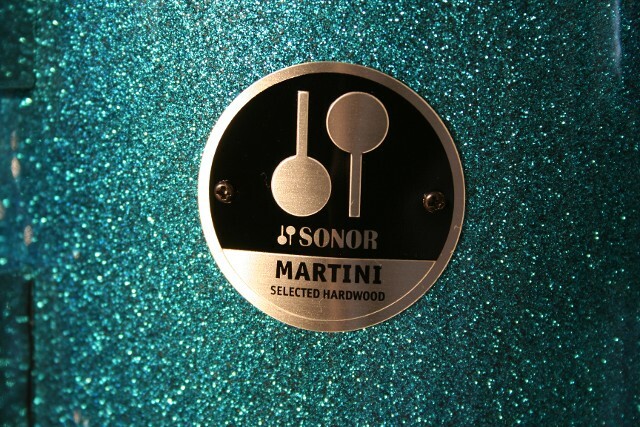 Introduced in the last quarter of 2013, The Sonor Martini has about a year and a half under it’s belt. 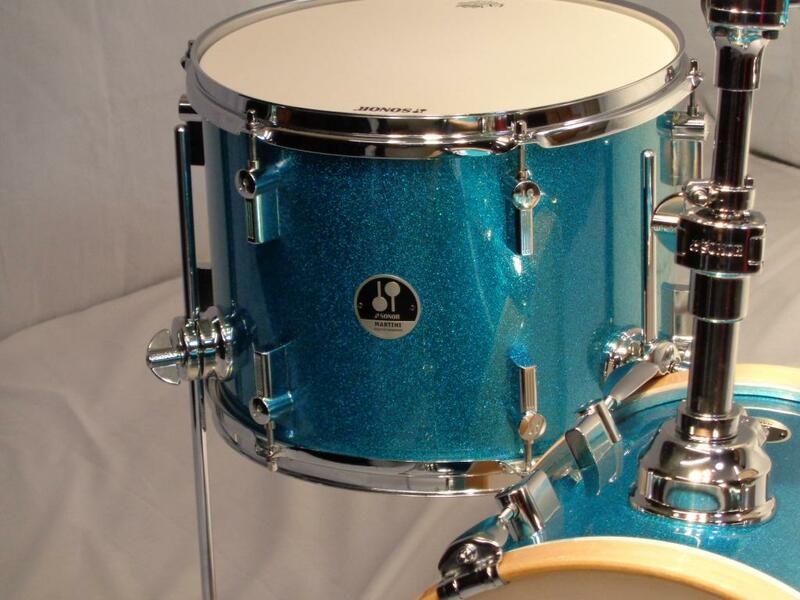 Originally only available in Turquoise Galaxy Sparkle, two additional wrap finishes have since been introduced. By default the Martini is the undisputed winner in the 14″ Featherweight-class as there are no other contenders. 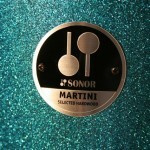 At a relatively low street price of US$350 the Martini is a consideration for anyone in the market for a small bop kit. 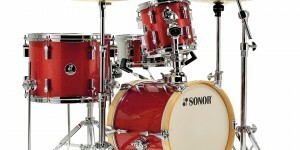 It’s larger brother, the Safari is also priced in the same range, placing Sonor as one of the more serious players in the entire “micro-bop” category. Value-priced means some of the appointments won’t be as snazzy as you’d expect from a kit a couple of hundred bucks north of the Martini’s modest US$350 street price. 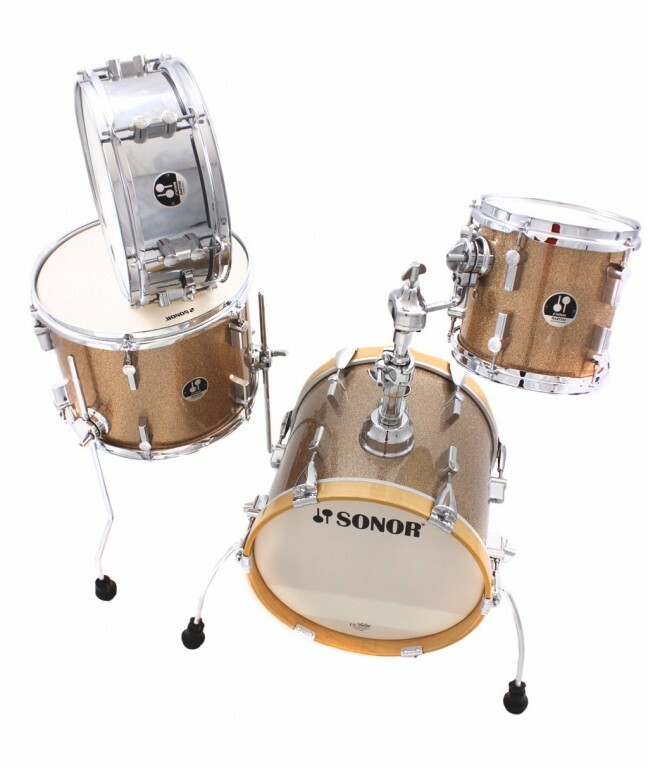 As such, the Sonor Martini comes with 1.6 mm rims, Remo’s entry level UX heads, Poplar shells, Absence of isolation gaskets, light-gauge lugs, one-sided vent grommets and a simple snare strainer. 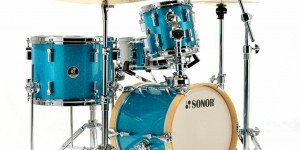 However the brackets, mounts and tune-safe lug feature are the same as in Sonor’s higher priced kits. Heads are often subject to replacement for personal preference reasons, and poplar isn’t a bad choice of shell material to begin with. The wraps are also of decent quality and have a nice glossy lustre. Sound of course is very much a matter of personal preference. Also one can’t expect thundering bass from a 14″ kick drum. Starting with the snare; Personally I really like the way it sounds tuned high. It has a very distinct attack with just the right amount of sustain and surprisingly not at all “tinny”. Among owners, the majority are really fond of it. Those who aren’t, seem to really dislike it though. I guess it’s one of those that either you really dig it, or you really don’t. No middle ground. The rack tom also sounds best tuned high, with only a short sustain and an almost timbale-like “ting”. 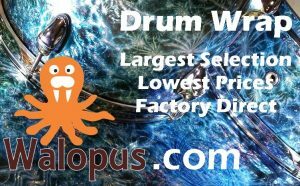 Not too timbale-like as a negative, but just enough to give it some character of it’s own. 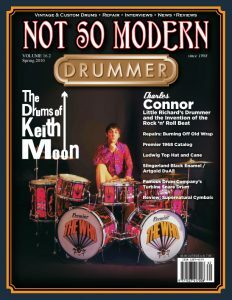 The floor tom, also short on the sustain scale, complements the rest of the kit nicely with a surprisingly wide range and mellow, controlled “woof”. 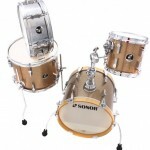 The bass drum, although a bit “thin” has surprising depth and can be tuned lower than expected. Although it sounds better and fuller tuned just a bit higher than the usual bass range. Overall, all components of the kit give a reasonably high quality feel. Fit and finish is above average for the price range. The chrome is all very smooth and shiny. The rack tom mounting holds it firmly in place and feels robust. 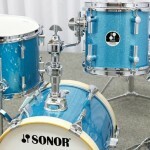 Although the bass drum riser looks flimsy, it functions very well and has just the right amount of lift. Eyeballing the height of the batter head’s centre, it seems to be roughly where the centre of a 22″ would be. Shell interiors are all smooth and consistent and the wood hoops have a real classy look to them. Visually the kit is well balanced and eye-catching. I think I want one! 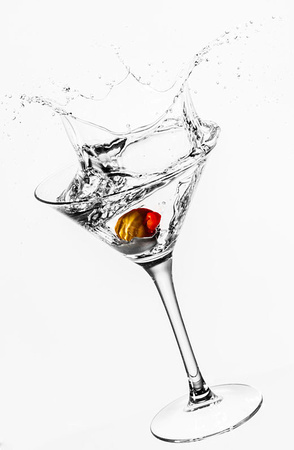 Mix ingredients and allow a ray of sunshine to shine through a bottle of vermouth and into the Martini. Small Car? Small Stage? Small Apartment? Introducing the Martini Special Edition, the tiny kit with the big attitude! 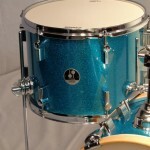 The kit features a Retro Turquois Galaxy Sparkle finish with offset Natural finish Bass Drum Hoops. 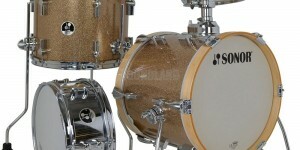 Cross-Laminated shells deliver superior stiffness, sonically pleasing resonance and spectacular tone. Tune Safe equipped lugs ensure that the tuning stays in place. The Martini Shell kit comes with an 14″ x 12″ Bass Drum (with Mount & Riser), 8″ x 8″ Tom Tom, 13″ x 10″ Floor Tom, 12″ x 5″ Steel Snare Drum and a single tom holder (hardware stands & cymbals not included). 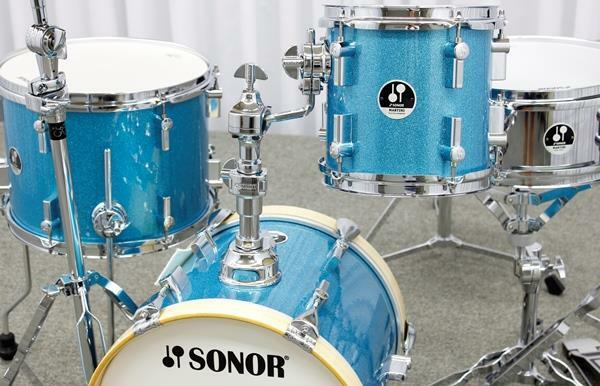 All SONOR lugs are equipped with the TuneSafe feature, which prevents tension rods from loosening during hard rim shots or where batter heads have been loosely tuned.